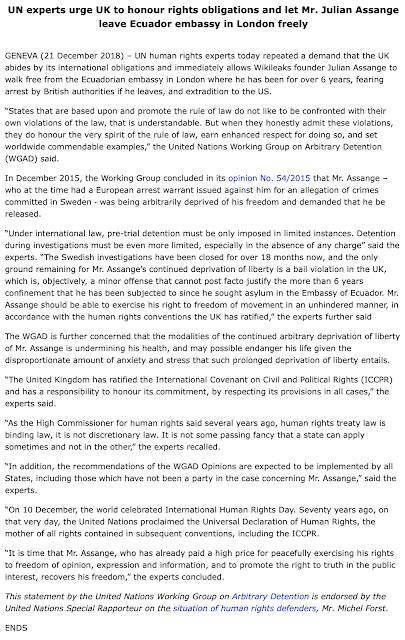 Now that Julian Assange has been forcibly removed from Ecuador's embassy in London, it is a good time to look back at a ruling by the High Commissioner of the United Nations Human Rights office. "Mr. Assange was arrested on 7 December 2010 in the United Kingdom, pursuant to a European Arrest Warrant issued against him after he was accused of sexual misconduct in Sweden. That accusation has not been substantiated and after he was interrogated in London the Swedish Prosecutor decided in 2017 not to pursue the investigation. 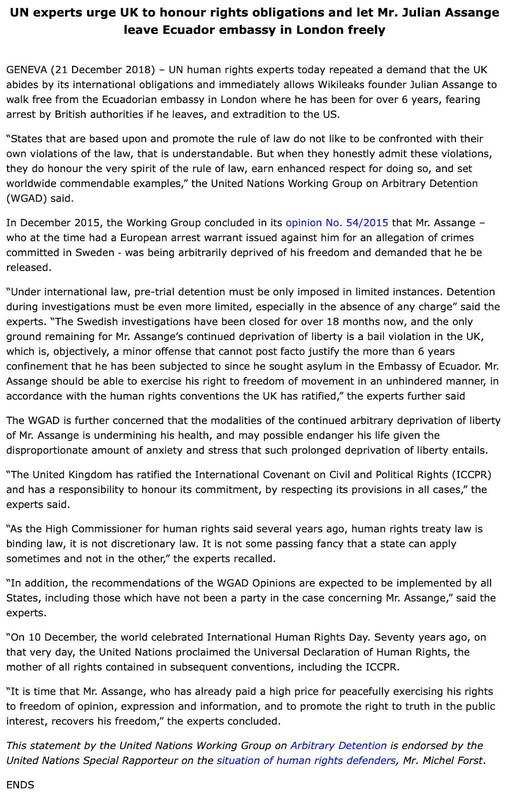 Mr. Assange has been de facto arbitrarily deprived of his liberty since 2012 without charge or trial. He was first detained on remand and in isolation for 10 days in a prison in London; he then spent 550 days on bail terms constituting house arrest, pending his appeal before the UK’s Supreme Court against his extradition to Sweden. When the Supreme Court upheld the extradition decision, he sought political asylum in the Embassy of Ecuador on 16 August 2012, citing fears of being extradited from Sweden to the USA. He claimed that he had reasonable grounds to believe that should he be extradited to the USA, he would face trial for having published, through Wikileaks, thousands of US classified diplomatic cables and documents. Ecuador granted him political asylum and later Ecuadorian citizenship. The United Kingdom has indicated that Mr. Assange’s fear to be extradited to the USA was unfounded. In April 2017, in his first public speech since becoming head of the CIA, Mr. Michael Pompeo described Wikileaks as a “hostile intelligence service” which claimed to act in the name of the defence of freedom of expression, freedom of information and privacy. The same month, the US Attorney General stated that it was a US priority to arrest and detain Julian Assange. On 15 November 2018, evidence emerged that the US Department of Justice was preparing an indictment against him but the charges have remained classified. As a result of the Swedish Prosecutor’s decision not to pursue the investigation against Mr. Assange, the European Arrest Warrant against him was nullified. The remaining ground for arresting him is his violation of the terms of the bail in 2012, when he walked to the embassy of Ecuador to seek political asylum. The terms of bail included reporting daily to the local police station. Just think of the money that has been spent to "police" Mr. Assange 24 hours a day since 2012. 5.) When the deprivation of liberty constitutes a violation of international law on the grounds of discrimination based on birth, national, ethnic or social origin, language, religion, economic condition, political or other opinion, gender, sexual orientation, disability, or any other status, that aims towards or can result in ignoring the equality of human beings (category V)." "The deprivation of liberty of Julian Assange is arbitrary and in contravention of articles 9 and 10 of the Universal Declaration of Human Rights and articles 7, 9 (1), (3) and (4), 10 and 14 of the International Covenant on Civil and Political Rights. It falls within category III of the categories applicable to the consideration of the cases submitted to the Working Group." It is highly likely that Mr. Assange will face legal persecution far beyond the punishment that the United Kingdom's legal system will impose for his violations of the terms of his bail which included daily reports to a local police station for a Swedish charge that was dropped. Mr. Assange, who has never been accused of publishing anything that was not entirely truthful, is now experiencing what happens to whistleblowers who present all of us with the painful reality of today's world. Eat Your Heart Out Elon Musk!